One of the most common uses of intravenous-to-oral (IV-to-PO) switch therapy is in the treatment of CAP. CAP is most commonly caused by Streptococcus pneumoniae infection. The natural history of CAP is beyond the scope of this article; see Pneumonia, Community-Acquired for more information. In terms of switch therapy, approximately 40-50% of patients admitted for intravenous antibiotics can be switched to oral antibiotics within 2-3 days. The US Medicare Pneumonia Project database provided evidence that the routine practice of in-hospital observation after the switch from intravenous to oral antibiotics in patients with CAP can be avoided in those who are clinically stable. Explicit physiological criteria must be recorded routinely to serve as a benchmark in order for the switch to be consistently successful. In 1999, Siegel reported that the treatment of hospitalized patients with uncomplicated CAP is changing to include a brief period of intravenous antibiotics followed by oral therapy. The Classification of Community-Acquired Pneumonia (CoCAP) is a stratification tool in which patients are categorized as having low-risk pneumonia, unstable pneumonia, or complicated pneumonia (see the image below). Caregivers can achieve a structure for organizing treatment of patients with CAP by using (1) validated hospital admission criteria, (2) the CoCAP algorithm, and (3) newly evolving criteria for switching patients from intravenous to oral therapy. Patients with unstable pneumonia can be discharged early if (1) their metabolic problems have reversed and comorbid conditions have stabilized and (2) they have not developed any serious pneumonia-related complications. Prolonged courses of intravenous antibiotic therapy are being replaced with 2- to 3-day courses of intravenous hydration and antibiotics; patients can be switched to oral therapy and can be discharged from the hospital after they tolerate one dose of oral therapy. The vital signs and the WBC count should be monitored, and, provided these parameters are improving (although possibly not normalized), patients can be switched to oral therapy. Sequential antibiotic therapy ensures an early switch to the oral route when a patient is clinically stable. This increasingly used strategy is safe and improves the quality and cost-effectiveness of health care. Timely and appropriate switch therapy must be underpinned by clear guidelines and supported by a multidisciplinary team. According to some authorities, approximately 40% of patients starting on intravenous antibiotics are candidates for a switch to oral antibiotics after 2-3 days of therapy. Fluoroquinolones are suitable for switch therapy. The intravenous and oral formulations of levofloxacin have same-dose bioequivalence, allowing for switch or step-down therapy from parenteral to oral formulations of the same agent at the same dose. In the late 1990s, ofloxacin was also used for switch therapy, but its role is unclear in switch therapy because it is a twice-a-day medication, whereas levofloxacin is a once-a-day medication. Fluoroquinolones should not be used in children because of a possible adverse effect on cartilage. Levofloxacin provides almost complete (≥99%) oral bioavailability, suggesting that oral administration may provide exposure that is comparable to that of the intravenous regimen. The overall clinical success rate in such a switch is 94.1%. In several randomized controlled trials, 5-14 days of treatment with intravenous and/or oral levofloxacin proved to be an effective therapy for patients with upper and lower respiratory tract infections. In patients with mild-to-severe community-acquired pneumonia (CAP), intravenous and/or oral levofloxacin at a dose of 500 mg once or twice daily was as effective as clarithromycin, azithromycin, and amoxicillin/clavulanic acid. Overall, clinical response rates with levofloxacin were 86-95% versus 88-96% with comparator agents; bacteriological response rates were 88-95% and 86-98%, respectively. Levofloxacin (Levaquin) has activity against pneumococci, including penicillin-resistant isolates, and activity against aerobic gram-negative rods but not Pseudomonas. It can be used to treat CAP. The adult dose is 500 mg PO qd for 7-14 d. It is not recommended for children. Levofloxacin is a pregnancy category C medication. Ofloxacin (Floxin) penetrates the prostate well and is effective against Chlamydia trachomatis. It is derived from pyridine carboxylic acid and has broad-spectrum bactericidal effect. It is specifically used to treat prostatitis and UTI. In adults, the dosing for prostatitis is 400 mg PO once, while dosing for chronic prostatitis is 200-400 mg PO q12h. It is not recommended for children. Ofloxacin is also a pregnancy category C medication. Ciprofloxacin (Cipro) is a fluoroquinolone with activity against pseudomonads and most gram-negative organisms but no activity against anaerobes. It inhibits bacterial DNA synthesis and, consequently, growth. Continue treatment for at least 2 d (7-14 d typical) after signs and symptoms have disappeared. The adult dose is 250-500 mg PO bid for 7-14 d. It is not indicated in children. Ciprofloxacin is a pregnancy category C medication. Similar switches can be effective with cephalosporins. Validated treatment algorithms, such as the Classification of Community-Acquired Pneumonia (CoCAP), now enable decisions concerning which patients with CAP require hospitalization and which patients will benefit from early switch therapy. Generally, unstable patients with CAP are suitable candidates for early switch therapy, which consists of rapid initiation of 1-2 days of intravenous therapy followed by 5 days of oral therapy, with early hospital discharge after the administration of 1-2 doses of oral antibiotic. Hamilton-Miller found that switch therapy to cefixime after 2-3 days used to treat serious infections resulted in excellent clinical outcomes. Similarly, Dagan and colleagues found that 1 or 2 days' treatment with parenteral ceftriaxone before switching to oral cefetamet pivoxil was safe and effective in the treatment of childhood pneumonia. This suggests that parenteral-to-oral switch therapy is a feasible treatment option in the treatment of serious pediatric CAP. Cefuroxime (Ceftin, Kefurox, Zinacef) is a second-generation cephalosporin that maintains gram-positive activity of first-generation cephalosporins and adds activity against Proteus mirabilis, Haemophilus influenzae, Escherichia coli, Klebsiella pneumoniae, and Moraxella catarrhalis. The condition of the patient, severity of the infection, and susceptibility of the microorganism determine proper dose and route of administration. The adult dose is 500 mg PO bid for 20 d or, alternatively, 750-1500 mg IV/IM q8h, not to exceed 6 g/d. In children, dosing is 250 mg PO bid for 20 d. Use the adult dose for adolescents. Cefuroxime is a pregnancy category C medication. Cefixime (Suprax) has activity against aerobic gram-negative rods. It arrests bacterial cell-wall synthesis and inhibits bacterial growth by binding to one or more of the penicillin-binding proteins. The adult dose is 400 mg PO qd (recommended for gonococcal infections); alternatively, 200 mg PO q12h or 400 mg PO qd or divided q12h can be used. In children < 12 years, dosing is 8 mg/kg PO qd or 4 mg/kg bid. In children >50 kg or >12 years, administer cefixime as in adults. Cefixime is a pregnancy category B medication. Fernandez and San Martin studied 40 patients admitted to the hospital because of CAP. Initially, these patients were treated with intravenous ceftriaxone (1 g/d) and showed clinical improvement after 3 days of therapy. They were randomly assigned to continue intravenous ceftriaxone therapy for a total of 10 days or to switch to ceftibuten (400 mg/d) for 7 days. Twenty-one of the patients continued intravenous treatment, and 19 were switched to ceftibuten. In terms of clinical cure, radiological improvement, and normalization of WBC count, no differences were noted between the 2 groups. These findings support the viability of switch therapy in this context. Ceftriaxone (Rocephin) is a third-generation cephalosporin with broad-spectrum, gram-negative activity. It has lower efficacy against gram-positive organisms. Ceftriaxone arrests bacterial growth by binding to one or more penicillin-binding proteins. In adults with uncomplicated infections, dosing is 250 mg IM once, not to exceed 4 g. In adults with severe infections, dosing is 1-2 g IV qd or divided bid, not to exceed 4 g/d. In neonates >7 days, dosing is 25-50 mg/kg IV/IM qd, not to exceed 125 mg/d. Dosing in infants and children is 50-75 mg/kg IV/IM qd divided q12h, not to exceed 2 g/d. Ceftriaxone is a pregnancy category B medication. Ceftibuten (Cedax) is a third-generation bactericidal cephalosporin that inhibits cell-wall mucopeptide synthesis. In adults, dosing is 400 mg PO qd for 10 d, not to exceed 400 mg/d. If the CrCl is 30-49 mL/min, administer 4.5 mg/kg or 200 mg PO qd. If the CrCl is < 30 mL/min, administer 2.25 mg/kg or 100 mg PO qd. In children < 12 years, dosing is 9 mg/kg PO qd for 10 d, not to exceed 400 mg/d. Administer as in adults in children >12 years. Ceftibuten is a pregnancy category B drug. Macrolides that can be used for switch therapy include azithromycin and clarithromycin. The macrolide azithromycin appears to be superior to the cephalosporin cefuroxime in intravenous therapy and a subsequent switch to oral therapy. This was shown in a cost-effectiveness analysis of IV-to-PO switch regimens of azithromycin versus cefuroxime with or without erythromycin in the treatment of patients hospitalized with CAP. Azithromycin (Zithromax) is active against gram-positive bacteria and organisms responsible for atypical pneumonia but resistant to erythromycin-resistant pneumococci. It inhibits bacterial growth, possibly by blocking dissociation of peptidyl tRNA from ribosomes, causing RNA-dependent protein synthesis to arrest. It is used to treat mild-to-moderate microbial infections. In adults, dosing is 500 mg PO on day 1 and 250 mg PO qd on days 2-5. Alternatively, 1 g PO once can be used. Dosing in children < 6 months has not been established. In children >6 months, dosing is 10 mg/kg PO once (not to exceed 500 mg/d) on day 1 and 5 mg/kg PO qd (not to exceed 250 mg/d) on days 2-5. Azithromycin is a pregnancy category B medication. Other antibiotics that can be used for switch therapy include clindamycin, ertapenem, linezolid, metronidazole, and trimethoprim-sulfamethoxazole. Martinez and associates found that switch therapy can be used when administering clindamycin. Specifically, a multicenter, prospective, controlled study compared the clinical efficacy, safety, and economic impact of pharmacist intervention to promote sequential IV-to-PO clindamycin conversion. Clindamycin was prescribed for respiratory tract infections in 38.9% of patients and for prophylaxis in surgery in 25.4% (71% were contaminated during surgery). A total of 473 patients receiving intravenous clindamycin for at least 72 hours were included in the study. Two groups were established. Those in the intervention group (204 patients) were given an informative sheet recommending the sequential treatment, and the other group consisted of 269 control patients. Outcomes appeared similar. Clindamycin (Cleocin) is a lincosamide used to treat serious skin and soft tissue staphylococcal infections. It is also effective against aerobic and anaerobic streptococci (except enterococci). It inhibits bacterial growth, possibly by blocking dissociation of peptidyl t-RNA from ribosomes, causing RNA-dependent protein synthesis to arrest. In adults, dosing is (1) 150-450 mg/dose PO q6-8h, not to exceed 1.8 g/d, or (2) 600-1200 mg/d IV/IM divided q6-8h, depending on the severity of infection. In children, dosing is 8-20 mg/kg/d PO as hydrochloride or 8-25 mg/kg/d as palmitate divided tid/qid. Alternatively, use 20-40 mg/kg/d IV/IM divided tid/qid. Clindamycin is a pregnancy category C medication. In 2003, Li et al noted that intravenous linezolid can be followed by oral linezolid; these regimens were found to shorten hospital stays. The exact timing of the switch depends on the clinical condition of the patient; oral and intravenous linezolid are relatively similar in effect. Linezolid is available in intravenous, film-coated tablet, and oral suspension forms. Linezolid can be assayed in serum and body fluids and has good bioavailability, with a maximum blood concentration at 0.5-2 hours. Metronidazole can be part of regimens for switching patients from intravenous to oral therapy. Treatment between prolonged intravenous therapy and intravenous therapy followed by conversion to oral antibiotic therapy is equivalent in children with perforated appendicitis. Similarly, a study noted 8 patients with brain abscesses who refused prolonged hospitalization and were treated with a short course (6-12 d) of intravenous antibiotics followed by prolonged treatment (15-19 wk) with an oral antibiotic regimen consisting of metronidazole, ciprofloxacin, and amoxicillin. All patients responded favorably based on clinical findings and imaging studies. Antifungals that can be used for switch therapy include itraconazole and fluconazole. Recently, the selective serotonin reuptake inhibitor citalopram has been administered as an intravenous infusion to patients with severe depression. The results from both open and double-blinded clinical studies with intravenous citalopram suggest that it is an effective and well-tolerated treatment for depression. Moreover, when infusion treatment is initiated and continued orally, citalopram is at least as effective as clomipramine, doxepin, and viloxazine. As with oral treatment, adverse events are mild to moderate in severity, and 50% of patients report no adverse events. Citalopram (Celexa) enhances serotonin activity because of selective reuptake inhibition at neuronal membrane. The adult dose is 20-40 mg PO qd. It is not indicated in children. Citalopram is a pregnancy category C drug, but use late in the third trimester is associated with complications in newborns and may result in prolonged hospitalization, respiratory support, and tube feeding. In patients younger than 65 years, doxepin plasma levels can be kept constant by switching in a ratio of 125 mg intravenous to 250 mg oral. Individual case studies indicated that declining progress after switching was correlated with a decreasing plasma level of the active drug. An already-low plasma level during the infusion period, insufficient response, and questionable compliance with the oral medication were associated factors. Owing to large (by a factor of 10) interindividual differences of plasma levels, measurements before and after switching were required. Doxepin (Adapin, Sinequan) increases the concentration of serotonin and norepinephrine in the CNS by inhibiting their reuptake by presynaptic neuronal membrane. Effects are associated with a decrease in symptoms of depression. Adult dosing is 30-150 mg/d PO hs or 2-3 divided doses, gradually increased to 300 mg/d prn. In children < 12 years, doxepin is not recommended. In those >12 years, dosing is 25-50 mg/d PO hs or bid/tid, gradually increased to 100 mg/d. Doxepin is a pregnancy category C drug. Promptly switching intravenous acetaminophen to oral acetaminophen is possible in patients with severe pain outbreaks if certain steps have been taken, including the establishment of a local consensus process, presentation of a short educational program, display of posters in all nurses' offices, and feedback regarding the practice 6 months after implementation of guidelines. Acyclovir (Zovirax) inhibits activity of both HSV-1 and HSV-2. It has affinity for viral thymidine kinase and, once phosphorylated, causes DNA chain termination when acted on by DNA polymerase. Patients experience less pain and faster resolution of cutaneous lesions when used within 48 h of rash onset. It may also prevent recurrent outbreaks. Early initiation of therapy is imperative. Adult dosing is 600-800 mg PO 5 times/d for 7 d or 10 mg/kg/dose IV q8h; initiate treatment immediately upon onset of symptoms of recurrent episodes. In immunocompromised adults, dosing is 800 mg PO q4h (5 times/d) for 7-10 d. In children, dosing is (1) 250-600 mg/m2/dose PO 4-5 times/d for 7-10 d or (2) 1500 mg/m2/d IV divided q8h or 10 mg/kg/dose IV q8h for 7 d.
The bioavailability of acyclovir is approximately 8%. The bioavailability of famciclovir and valacyclovir is approximately 50%. Now that famciclovir and valacyclovir have been approved, choosing either agent seems advisable when switching from intravenous acyclovir to an oral agent. Inpatients with nonsevere community-acquired pneumonia (CAP) can be effectively and safely treated with oral antimicrobials from the time of admission, whereas those with severe pneumonia can be treated with early switch therapy. Once a hospitalized patient with CAP is clinically stable, switching from intravenous to oral antibiotics, even if the bacteremia was initially documented to be caused by S pneumoniae, is safe. Important questions include how to identify candidates for an early switch and how to effect the IV-to-PO switch. Releasing IV-to-PO switch guidelines alone is not sufficient. Electronic drug-ordering systems have been introduced during the past years, enabling a central computer to provide a daily list of all patients who are on intravenous antibiotics for more than 48 hours and are therefore potential candidates for an IV-to-PO switch. The consulting infectious diseases physician can review these patients' charts and contact the attending physician to investigate whether the patient can indeed be switched to oral therapy. Electronic drug-ordering systems might be a more convenient way to streamline antibiotic prescribing methods. According to Wilcox, less obvious potential benefits of sequential antimicrobial therapy include fewer intravascular catheter infections because of shorter line-dwell times and less endoluminal contamination. Sequential antimicrobial therapy may also be used as part of a policy to reduce the selective pressure, particularly due to cephalosporin use, for endemic hospital pathogens such as C difficile and extended-spectrum–producing gram-negative bacilli. What are the benefits of switching from intravenous to oral therapy? What is the role of intravenous-to-oral switch therapy in the treatment of community-acquired pneumonia (CAP)? How do different approaches to intravenous-to-oral switch therapy in the treatment of community-acquired pneumonia (CAP) affect outcomes? What is the efficacy of intravenous-to-oral switch therapy in the treatment of community-acquired pneumonia (CAP)? In which conditions is intravenous-to-oral switch therapy beneficial? What is the role of clarithromycin in intravenous-to-oral switch therapy? What is the role of metronidazole in intravenous-to-oral switch therapy? What is the role of trimethoprim-sulfamethoxazole (Bactrim) in intravenous-to-oral switch therapy? Which antibiotic therapies are options for intravenous-to-oral switch therapy? What is the role of fluoroquinolones in intravenous-to-oral switch therapy? What are the roles of levofloxacin and ofloxacin in intravenous-to-oral switch therapy? What is the efficacy of levofloxacin and ofloxacin in intravenous-to-oral switch therapy? What is the role of ciprofloxacin in intravenous-to-oral switch therapy? What is the role of moxifloxacin in intravenous-to-oral switch therapy? What is the role of delafloxacin in intravenous-to-oral switch therapy? What is the efficacy of cephalosporins in intravenous-to-oral switch therapy? What are the roles of cefuroxime (Ceftin, Kefurox, Zinacef) and cefixime (SUPRAX) in intravenous-to-oral switch therapy? What is the role of ceftriaxone (Rocephin) and ceftibuten (Cedax) in intravenous-to-oral switch therapy? Which macrolides are used in intravenous-to-oral switch therapy? What is the role of azithromycin in intravenous-to-oral switch therapy? What is the role of clindamycin (Cleocin) in intravenous-to-oral switch therapy? What is the role of ertapenem in intravenous-to-oral switch therapy? What is the role of linezolid in intravenous-to-oral switch therapy? What are antifungals that can be used in intravenous-to-oral switch therapy? What is the role of citalopram in intravenous-to-oral switch therapy? What is the role of doxepin in intravenous-to-oral switch therapy? What is the role of acetaminophen in intravenous-to-oral switch therapy? What is the role of acyclovir (Zovirax) in intravenous-to-oral switch therapy? What is the role of famciclovir and valacyclovir in intravenous-to-oral switch therapy? When can patients with community-acquired pneumonia (CAP) be treated with intravenous-to-oral switch therapy? What are the median thresholds at which a typical patient can undergo intravenous-to-oral switch therapy? What is the efficacy of early implementation of intravenous-to-oral switch therapy? What is the role of electronic drug ordering systems in the implementation of intravenous-to-oral switch therapy? What are special concerns in intravenous-to-oral switch therapy? Dunn K, O'Reilly A, Silke B, Rogers T, Bergin C. Implementing a pharmacist-led sequential antimicrobial therapy strategy: a controlled before-and-after study. Int J Clin Pharm. 2011 Apr. 2:208-14. [Medline]. Eckmann C, Lawson W, Nathwani D, Solem CT, Stephens JM, Macahilig C, et al. Undefined. Int J Antimicrob Agents. 2014 Jul. 44(1):56-64. [Medline]. Cyriac JM, James E. Switch over from intravenous to oral therapy: A concise overview. J Pharmacol Pharmacother. 2014 Apr. 5(2):83-7. [Medline]. Achim J. Kaasch, Gerd Fätkenheuer, Reinhild Prinz-Langenohl, Ursula Paulus, Martin Hellmich, Verena Weiß, et al. Early oral switch therapy in low-risk Staphylococcus aureus bloodstream infection (SABATO): study protocol for a randomized controlled trial. Trials. 2015. 16:450. [Medline]. Ashraf El Houfi, Nadeem Javed, Caitlyn T Solem, Cynthia Macahilig, Jennifer M Stephens, Nirvana Raghubir, et al. Early-switch/early-discharge opportunities for hospitalized patients with methicillin-resistant Staphylococcus aureus complicated skin and soft tissue infections: proof of concept in the United Arab Emirates. Infect Drug Resist. 2015. 8:173–179. [Medline]. Mertz D, Koller M, Haller P, Lampert ML, Plagge H, Hug B, et al. Outcomes of early switching from intravenous to oral antibiotics on medical wards. J Antimicrob Chemother. 2009. 64:188-99. [Medline]. Athanassa Z, Makris G, Dimopoulos G, Falagas ME. Early switch to oral treatment in patients with moderate to severe community-acquired pneumonia: a meta-analysis. Drugs. 2008. 68:2469-81. [Medline]. Buyle F, Vogelaers D, Peleman R, Van Maele G, Robays H. Implementation of guidelines for sequential therapy with fluoroquinolones in a Belgian hospital. Pharm World Sci. 2010 Jun. 32(3):404-10. [Medline]. Engel MF, Postma DF, Hulscher ME, et al. Barriers to an early switch from intravenous to oral antibiotic therapy in hospitalised patients with community-acquired pneumonia. Eur Respir J. 2012 May 31. [Medline]. van Niekerk AC, Venter DJ, Boschmans SA. Implementation of intravenous to oral antibiotic switch therapy guidelines in the general medical wards of a tertiary-level hospital in South Africa. J Antimicrob Chemother. 2012 Mar. 67:756-62. [Medline]. Bassetti M, Baguneid M, Bouza E, Dryden M, Nathwani D, Wilcox M. European perspective and update on the management of complicated skin and soft tissue infections due to methicillin-resistant Staphylococcus aureus after more than 10 years of experience with linezolid. Clin Microbiol Infect. 2014 Apr 20. Suppl 4:3-18. [Medline]. Nathan RV, Rhew DC, Murray C, Bratzler DW, Houck PM, Weingarten SR. In-hospital observation after antibiotic switch in pneumonia: a national evaluation. Am J Med. 2006 Jun. 119(6):512.e1-7. [Medline]. Siegel RE. Strategies for early discharge of the hospitalized patient with community-acquired pneumonia. Clin Chest Med. 1999 Sep. 20(3):599-605. [Medline]. Kohno S, Yanagihara K, Yamamoto Y, et al. Early switch therapy from intravenous sulbactam/ampicillin to oral garenoxacin in patients with community-acquired pneumonia: a multicenter, randomized study in Japan. J Infect Chemother. 2013 Dec. 19(6):1035-41. [Medline]. Ramírez JA; Community-Acquired Pneumonia Organization Investigators. Worldwide perspective of the quality of care provided to hospitalized patients with community-acquired pneumonia: results from the CAPO international cohort study. Semin Respir Crit Care Med. 2005 Dec. 26(6):543-52. [Medline]. Rifkin WD, Conner D, Silver A, Eichorn A. Comparison of processes and outcomes of pneumonia care between hospitals and community-based primary care physicians. Mayo Clin Proc. 2002 Oct. 77(10):1053-8. [Medline]. Wawruch M, Bozekova L, Krcmery S, et al. Cost-effectiveness analysis of switching from intravenous to oral administration of antibiotics in elderly patients. Bratisl Lek Listy. 2004. 105(10-11):374-8. [Medline]. Oosterheert JJ, Bonten MJ, Schneider MM, Buskens E, Lammers JW, Hustinx WM. Effectiveness of early switch from intravenous to oral antibiotics in severe community acquired pneumonia: multicentre randomised trial. BMJ. Epub 2006 Nov 7. 333(7580):1193. [Medline]. Peyrani P, Christensen D, LaJoie AS, Nakamatsu R, Arnold F, Schulz P, et al. Antibiotic therapy of hospitalized patients with community-acquired pneumonia: an international perspective from the CAPO Cohort Study.J Ky Med Assoc. 2006 Nov;104(11):513-7. [Medline]. Rhew DC, Tu GS, Ofman J, et al. Early switch and early discharge strategies in patients with community- acquired pneumonia: a meta-analysis. Arch Intern Med. 2001 Mar 12. 161(5):722-7. [Medline]. Angeli P, Guarda S, Fasolato S, Miola E, Craighero R, Piccolo F. Switch therapy with ciprofloxacin vs. intravenous ceftazidime in the treatment of spontaneous bacterial peritonitis in patients with cirrhosis: similar efficacy at lower cost. Aliment Pharmacol Ther. 2006 Jan 1. 23(1):75-84. [Medline]. Uçkay I, Tovmirzaeva L, Garbino J, et al. Short parenteral antibiotic treatment for adult septic arthritis after successful drainage. Int J Infect Dis. 2013 Mar. 17(3):e199-205. [Medline]. Monmaturapoj T, Montakantikul P, Mootsikapun P, Tragulpiankit P. A prospective, randomized, double dummy, placebo-controlled trial of oral cefditoren pivoxil 400mg once daily as switch therapy after intravenous ceftriaxone in the treatment of acute pyelonephritis. Int J Infect Dis. 2012 Dec. 16(12):e843-9. [Medline]. Mikamo H, Iwasaku K, Yamagishi Y, Matsumizu M, Nagashima M. Efficacy and safety of intravenous azithromycin followed by oral azithromycin for the treatment of acute pelvic inflammatory disease and perihepatitis in Japanese women. J Infect Chemother. 2014 Jul. 20(7):429-35. [Medline]. Cunha BA. Intravenous to oral antibiotic switch therapy. Drugs Today (Barc). May 2001. 37(5):311-9. [Medline]. Vogtlander NP, Van Kasteren ME, Natsch S, et al. Improving the process of antibiotic therapy in daily practice: interventions to optimize timing, dosage adjustment to renal function, and switch therapy. Arch Intern Med. 2004 Jun 14. 164(11):1206-12. [Medline]. Pablos AI, Escobar I, Albinana S, et al. Evaluation of an antibiotic intravenous to oral sequential therapy program. Pharmacoepidemiol Drug Saf. 2005 Jan. 14(1):53-9. [Medline]. Giamarellou H, Bassaris HP, Petrikkos G, et al. Monotherapy with intravenous followed by oral high-dose ciprofloxacin versus combination therapy with ceftazidime plus amikacin as initial empiric therapy for granulocytopenic patients with fever. Antimicrob Agents Chemother. 2000 Dec. 44(12):3264-71. [Medline]. Solomkin JS, Reinhart HH, Dellinger EP, et al. Results of a randomized trial comparing sequential intravenous/oral treatment with ciprofloxacin plus metronidazole to imipenem/cilastatin for intra-abdominal infections. The Intra-Abdominal Infection Study Group. Ann Surg. 1996 Mar. 223(3):303-15. [Medline]. Drummond MF, Becker DL, Hux M, et al. An economic evaluation of sequential i.v./po moxifloxacin therapy compared to i.v./po co-amoxiclav with or without clarithromycin in the treatment of community-acquired pneumonia. Chest. 2003 Aug. 124(2):526-35. [Medline]. Finch R, Schurmann D, Collins O, et al. Randomized controlled trial of sequential IV and oral moxifloxacin compared with sequential IV and oral co-amoxiclav with or without clarithromycin in patients with community-acquired pneumonia requiring initial parenteral treatment. Antimicrob Agents Chemother. 2002 Jun. 46(6):1746-54. [Medline]. Van den Brande P, Vondra V, Vogel F, et al. Sequential therapy with cefuroxime followed by cefuroxime axetil in community-acquired pneumonia. Chest. 1997 Aug. 112(2):406-15. [Medline]. Hamilton-Miller J. Cefixime for switch therapy. Chemotherapy. 1998 Sep. 44 Suppl 1:24-7. [Medline]. Dagan R, Syrogiannopoulos G, Ashkenazi S, et al. Parenteral-oral switch in the management of paediatric pneumonia. Drugs. 1994. 47 Suppl 3:43-51. [Medline]. Fernandez P, San Martin L. [Community acquired pneumonia: from intravenous to oral cephalosporin sequential therapy]. Rev Med Chil. 2000 Mar. 128(3):267-72. [Medline]. Parola D, Dell'Orso D, Terzano C. [Efficacy and safety of clarithromycin in the treatment of community-acquired pneumonia]. Recenti Prog Med. 2000 Jan. 91(1):12-5. [Medline]. Martinez MJ, Freire A, Castro I, et al. Clinical and economic impact of a pharmacist-intervention to promote sequential intravenous to oral clindamycin conversion. Pharm World Sci. 2000 Apr. 22(2):53-8. [Medline]. Tomera KM, Burdmann EA, Reyna OG, et al. Ertapenem versus ceftriaxone followed by appropriate oral therapy for treatment of complicated urinary tract infections in adults: results of a prospective, randomized, double-blind multicenter study. Antimicrob Agents Chemother. 2002 Sep. 46(9):2895-900. [Medline]. Li JZ, Willke RJ, Rittenhouse BE, Rybak MJ. Effect of linezolid versus vancomycin on length of hospital stay in patients with complicated skin and soft tissue infections caused by known or suspected methicillin-resistant staphylococci: results from a randomized clinical trial. Surg Infect (Larchmt). 2003 Spring. 4(1):57-70. [Medline]. Starakis I, Karravias D, Asimakopoulos C, et al. Results of a prospective, randomized, double blind comparison of the efficacy and the safety of sequential ciprofloxacin (intravenous/oral)+metronidazole (intravenous/oral) with ceftriaxone (intravenous)+metronidazole (intravenous/oral) for the treatment of intra-abdominal infections. Int J Antimicrob Agents. 2003 Jan. 21(1):49-57. [Medline]. Gollin G, Abarbanell A, Moores D. Oral antibiotics in the management of perforated appendicitis in children. Am Surg. 2002 Dec. 68(12):1072-4. [Medline]. Purkins L, Wood N, Ghahramani P, et al. Pharmacokinetics and safety of voriconazole following intravenous- to oral-dose escalation regimens. Antimicrob Agents Chemother. 2002 Aug. 46(8):2546-53. [Medline]. Winston DJ, Busuttil RW. Randomized controlled trial of oral itraconazole solution versus intravenous/oral fluconazole for prevention of fungal infections in liver transplant recipients. Transplantation. 2002 Sep 15. 74(5):688-95. [Medline]. Bal AM, Shankland GS, Scott G, Imtiaz T, Macaulay R, McGill M. Antifungal step-down therapy based on hospital intravenous to oral switch policy and susceptibility testing in adult patients with candidaemia: a single centre experience. Int J Clin Pract. 2014 Jan. 68(1):20-7. [Medline]. Kasper S, Muller-Spahn F. Intravenous antidepressant treatment: focus on citalopram. Eur Arch Psychiatry Clin Neurosci. 2002 Jun. 252(3):105-9. [Medline]. Celexa (citalopram hydrobromide) [package insert]. St. Louis, Missouri: Forest Pharmaceuticals, Inc. August, 2011. Available at [Full Text]. US Food and Drug Administration. Celexa (citalopram hydrobromide): Drug safety communication – abnormal heart rhythms associated with high doses. Available at http://www.fda.gov/Safety/MedWatch/SafetyInformation/SafetyAlertsforHumanMedicalProducts/ucm269481.htm. Accessed: August 24, 2011. Adler L, Hajak G, Lehmann K, et al. On the problems of switching from intravenous to oral administration in drug treatment of endogenous depression--a placebo-controlled double- blind trial with doxepin. Pharmacopsychiatry. 1997 Mar. 30(2):62-9. [Medline]. Carcao MD, Lau RC, Gupta A, et al. Sequential use of intravenous and oral acyclovir in the therapy of varicella in immunocompromised children. Pediatr Infect Dis J. 1998 Jul. 17(7):626-31. [Medline]. Halm EA, Switzer GE, Mittman BS, et al. What factors influence physicians' decisions to switch from intravenous to oral antibiotics for community-acquired pneumonia?. J Gen Intern Med. 2001 Sep. 16(9):599-605. [Medline]. Ramirez JA. Managing antiinfective therapy of community-acquired pneumonia in the hospital setting: focus on switch therapy. Pharmacotherapy. 2001 Jul. 21(7 Pt 2):79S-82S. [Medline]. Ramirez JA, Vargas S, Ritter GW, et al. Early switch from intravenous to oral antibiotics and early hospital discharge: a prospective observational study of 200 consecutive patients with community-acquired pneumonia. Arch Intern Med. 1999 Nov 8. 159(20):2449-54. [Medline]. Darley ES, Bannister GC, Blom AW, Macgowan AP, Jacobson SK, Alfouzan W. Role of early intravenous to oral antibiotic switch therapy in the management of prosthetic hip infection treated with one- or two-stage replacement. J Antimicrob Chemother. 2011 Jul. [Medline]. Teich JM, Petronzio AM, Gerner JR, et al. An information system to promote intravenous-to-oral medication conversion. Proc AMIA Symp. 1999. 415-9. [Medline]. Wilcox MH. Implementation of sequential therapy programs--a microbiologist's view. J Infect. 1998 Jul. 37 Suppl 1:51-4. [Medline]. Caceres VM, Stange KC, Kikano GE, Zyzanski SJ. The clinical utility of a day of hospital observation after switching from intravenous to oral antibiotic therapy in the treatment of pyelonephritis. J Fam Pract. 1994 Oct. 39(4):337-9. [Medline]. Shullo MA, Schonder K, Teuteberg JJ. Elevated tacrolimus levels associated with intravenous azithromycin and ceftriaxone: a case report. Transplant Proc. 2010 Jun. 42(5):1870-2. [Medline]. Ahkee S, Smith S, Newman D, et al. Early switch from intravenous to oral antibiotics in hospitalized patients with infections: a 6-month prospective study. Pharmacotherapy. 1997 May-Jun. 17(3):569-75. [Medline]. Cunha BA. Antibiotic Essentials. 9th ed. Royal Oak, MI: Physicians Press; 2010. Barlow GD, Nathwani D. Sequential antibiotic therapy. Curr Opin Infect Dis. 2000 Dec. 13(6):599-607. [Medline]. Bui K, Quintiliani R. Antimicrobial switch therapy. Conn Med. 1998 Nov. 62(11):665-8. [Medline]. Cassiere HA, Fein AM. Duration and route of antibiotic therapy in community-acquired pneumonia: switch and step-down therapy. Semin Respir Infect. 1998 Mar. 13(1):36-42. [Medline]. Cunha BA. Empiric oral monotherapy for hospitalized patients with community-acquired pneumonia: an idea whose time has come. Eur J Clin Microbiol Infect Dis. 2004 Feb. 23(2):78-81. [Medline]. Cunha BA. Intravenous-to-oral antibiotic switch therapy. A cost-effective approach. Postgrad Med. 1997 Apr. 101(4):111-2, 115-8, 122-3 passim. [Medline]. Cunha BA. Methicillin-resistant Staphylococcus aureus: clinical manifestations and antimicrobial therapy. Clin Microbiol Infect. 2005 Jul. 11 Suppl 4:33-42. [Medline]. Cunha BA. Oral antibiotic therapy of serious systemic infections. Med Clin North Am. 2006. 90:1197-2222. [Medline]. Cunha BA. Oral antibiotic treatment of MRSA infections. J Hosp Infect. 2005 May. 60(1):88-90. [Medline]. Cunha BA. Oral or intravenous-to-oral antibiotic switch therapy for treating patients with community-acquired pneumonia. Am J Med. 2001 Oct 1. 111(5):412-3. [Medline]. Fischer MA, Solomon DH, Teich JM, Avorn J. Conversion from intravenous to oral medications: assessment of a computerized intervention for hospitalized patients. Arch Intern Med. 2003 Nov 24. 163(21):2585-9. [Medline]. Furlanut M, Brollo L, Lugatti E, et al. Pharmacokinetic aspects of levofloxacin 500 mg once daily during sequential intravenous/oral therapy in patients with lower respiratory tract infections. J Antimicrob Chemother. 2003 Jan. 51(1):101-6. [Medline]. Handoko KB, van Asselt GJ, Overdiek JW. [Preventing prolonged antibiotic therapy by active implementation of switch guidelines]. Ned Tijdschr Geneeskd. 2004 Jan 31. 148(5):222-6. [Medline]. Janknegt R, van der Meer JW. Sequential therapy with intravenous and oral cephalosporins. J Antimicrob Chemother. 1994 Jan. 33(1):169-77. [Medline]. Jensen KM, Paladino JA. Cost-effectiveness of abbreviating the duration of intravenous antibacterial therapy with oral fluoroquinolones. Pharmacoeconomics. 1997 Jan. 11(1):64-74. [Medline]. Jewesson P. Cost-effectiveness and value of an IV switch. Pharmacoeconomics. 1994. 5(Suppl 2):20-6. [Medline]. Laing RB, Mackenzie AR, Shaw H, et al. The effect of intravenous-to-oral switch guidelines on the use of parenteral antimicrobials in medical wards. J Antimicrob Chemother. 1998 Jul. 42(1):107-11. [Medline]. Lelekis M, Gould IM. Sequential antibiotic therapy for cost containment in the hospital setting: why not?. J Hosp Infect. 2001 Aug. 48(4):249-57. [Medline]. Luke DR, Peterson J. Treatment of complicated intra-abdominal infections: comparison of the tolerability and safety of intravenous/oral trovafloxacin versus intravenous imipenem/cilastatin switching to oral amoxycillin/clavulanic acid. Int J Clin Pract. 1999 Apr-May. 53(3):166-73. [Medline]. Marrie TJ, Lau CY, Wheeler SL, Wong CJ, Feagan BG. Predictors of symptom resolution in patients with community-acquired pneumonia. Clin Infect Dis. 2000 Dec. 31(6):1362-7. [Medline]. Milkovich G. Intravenous-to-oral transition therapy in community-acquired pneumonia: the INOVA Health System experience. Pharmacotherapy. 2001 Jul. 21(7 Pt 2):83S-88S. [Medline]. Nathwani D, Boyter A, Fegan PG, Davey P. Switch therapy in community-acquired pneumonia. Arch Intern Med. 1996 Jun 10. 156(11):1235. [Medline]. Omidvari K, de Boisblanc BP, Karam G, et al. Early transition to oral antibiotic therapy for community-acquired pneumonia: duration of therapy, clinical outcomes, and cost analysis. Respir Med. 1998 Aug. 92(8):1032-9. [Medline]. Paladino JA, Gudgel LD, Forrest A, Niederman MS. Cost-effectiveness of IV-to-oral switch therapy: azithromycin vs cefuroxime with or without erythromycin for the treatment of community- acquired pneumonia. Chest. 2002 Oct. 122(4):1271-9. [Medline]. Paladino JA, Sperry HE, Backes JM, et al. Clinical and economic evaluation of oral ciprofloxacin after an abbreviated course of intravenous antibiotics. Am J Med. 1991 Nov. 91(5):462-70. [Medline]. Partsch DJ, Paladino JA. Cost-effectiveness comparison of sequential ofloxacin versus standard switch therapy. Ann Pharmacother. 1997 Oct. 31(10):1137-45. [Medline]. Pea F, Ferrari E, Pavan F, Roman-Pognuz D, Bandello F, Furlanut M. Levofloxacin disposition over time in aqueous humor of patients undergoing cataract surgery. Antimicrob Agents Chemother. 2005 Jun. 49(6):2554-7. [Medline]. Pelly L. IV-to-oral switch therapy for community-acquired pneumonia requiring hospitalization: focus on gatifloxacin. Adv Ther. 2002 Sep-Oct. 19(5):229-42. [Medline]. Prins JM, Nellen JF, Koopmans RP, et al. Electronic drug ordering system can be helpful to implement iv-oral switch guidelines. J Antimicrob Chemother. 2000 Sep. 46(3):518-9. [Medline]. Quintiliani R, Nightingale CH. Transitional antibiotic therapy. Infect Dis Clin Practice. 1994. 3:161-167. Ramirez JA. 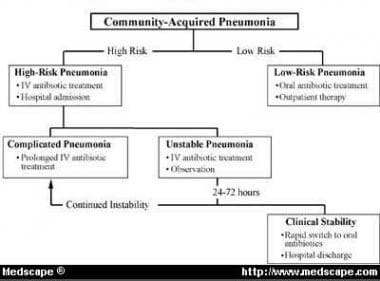 Switch therapy in community-acquired pneumonia. Diagn Microbiol Infect Dis. 1995 May-Jun. 22(1-2):219-23. [Medline]. Ramirez JA. Switch therapy with beta-lactam/beta-lactamase inhibitors in patients with community-acquired pneumonia. Ann Pharmacother. 1998 Jan. 32(1):S22-6. [Medline]. Ramirez JA, Bordon J. Early switch from intravenous to oral antibiotics in hospitalized patients with bacteremic community-acquired Streptococcus pneumoniae pneumonia. Arch Intern Med. 2001 Mar 26. 161(6):848-50. [Medline]. Rebuck JA, Fish DN, Abraham E. Pharmacokinetics of intravenous and oral levofloxacin in critically ill adults in a medical intensive care unit. Pharmacotherapy. 2002 Oct. 22(10):1216-25. [Medline]. Ripouteau C, Conort O, Lamas JP, et al. Effect of multifaceted intervention promoting early switch from intravenous to oral acetaminophen for postoperative pain: controlled, prospective, before and after study. BMJ. 2000 Dec 9. 321(7274):1460-3. [Medline]. Schaeffer AJ. The expanding role of fluoroquinolones. Am J Med. 2002 Jul 8. 113 Suppl 1A:45S-54S. [Medline]. Schouten JA, Hulscher ME, Trap-Liefers J, Akkermans RP, Kullberg BJ, Grol RP, et al. Tailored interventions to improve antibiotic use for lower respiratory tract infections in hospitals: a cluster-randomized, controlled trial.Clin Infect Dis. 2007 Apr 1;44(7):931-41. [Medline]. Sensakovic JW, Smith LG. Oral antibiotic treatment of infectious diseases. Med Clin North Am. 2001 Jan. 85(1):115-23, vii. [Medline]. [Guideline] Sevinc F, Prins JM, Koopmans RP, et al. Early switch from intravenous to oral antibiotics: guidelines and implementation in a large teaching hospital. J Antimicrob Chemother. 1999 Apr. 43(4):601-6. [Medline]. Siegel R. How short can courses be in lower respiratory tract infections?. J Int Med Res. 2000. 28 Suppl 1:37A-47A. [Medline]. Siegel RE, Halpern NA, Almenoff PL, Lee A, Cashin R, Greene JG. A prospective randomized study of inpatient iv. antibiotics for community-acquired pneumonia. The optimal duration of therapy. Chest. 1996 Oct. 110(4):965-71. [Medline]. Skoutelis AT, Gogos CA, Maraziotis TE, Bassaris HP. Management of brain abscesses with sequential intravenous/oral antibiotic therapy. Eur J Clin Microbiol Infect Dis. 2000 May. 19(5):332-5. [Medline]. Tan JS, File TM Jr. Management of community-acquired pneumonia: a focus on conversion from hospital to the ambulatory setting. Am J Respir Med. 2003. 2(5):385-94. [Medline]. Candel FJ, Peñuelas M. Delafloxacin: design, development and potential place in therapy. Drug Des Devel Ther. 2017. 11:881-891. [Medline]. [Full Text]. O'Riordan W, Mehra P, Manos P, Kingsley J, Lawrence L, Cammarata S. A randomized phase 2 study comparing two doses of delafloxacin with tigecycline in adults with complicated skin and skin-structure infections. Int J Infect Dis. 2015 Jan. 30:67-73. [Medline]. Baxdela (delafloxacin) [package insert]. 300 Tri-State International Lincolnshire, Illinois, USA: Melinta Therapeutics, Inc. 6/2017. Available at [Full Text]. Oral Antibiotics for Infective Endocarditis: Time to Switch?